Takagi tankless water heaters are designed to give you endless* hot water while helping you save money. Heating water only when you’re using it, Takagi models incur no standby energy losses, providing efficient heating while conserving energy. They also provide great peak-time flexibility for households with multiple members—no more worries about staggering showers or delaying laundry. Takagi tankless water heaters take up much less space than conventional tank-type water heaters or boilers, utilizing a wall mount design that allows for additional storage and flexibility. 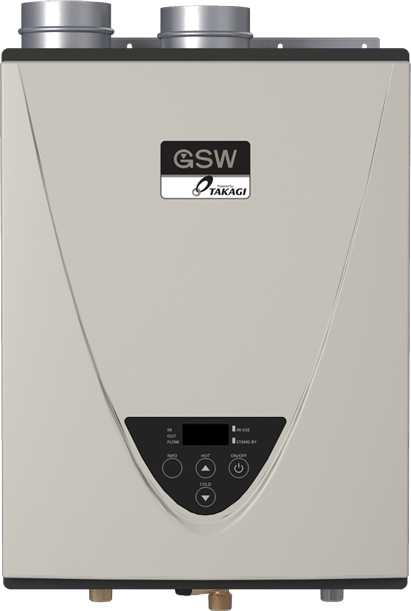 With durable, commercial-grade parts, Takagi water heaters are built to deliver reliable performance year after year. *When sized appropriately for your home’s needs. Compact Size: Only 13.8 inches wide, the T-K3 can be recessed between wall studs for even more space savings! A special recess box is available for outdoor installations. Lower Activating Flow Rate: The T-K3 activates at only 0.5 GPM, which allows the use of smaller water flows in bathroom sinks and showers. This reduces water waste and allows for stable temperatures. Parallel Installation: Using Takagi's Easy Link technology, the T-K3 can be installed in parallel with up to three other units without the use of an additional control box, generating more flow while saving money, space and installation time. Four T-K3 unites will deliver a total of 21.6 GPM at 60 degrees F delta T; or 26 GPM at a 50 degree F delta T.
Direct-Vent Conversion: The T-K3 can be easily converted into a direct vent model for inside installations that need to import combustion air from outside. Eight Temperature Settings: Instead of the usual four settings, the T-K3 offers eight separate temperatures, set by dip-switch: 104 degree F, 113 degree F, 122 degree F, 131 degree F, 140 degree F, 158 degree F, 176 degree F, and 185 degree F. This versatility reduces the need for a separate remote control. However, setting temperatures other than the eight presets requires the TM-RE10 temperature controller. Longer vent runs: The T-K3 can have a vent pipe run up to 50 feet with five elbows, instead of the normal 35 with three elbows. As you can see, the T-K3 incorporates all those "why-don't-you-have-this?" features into this one new product. Its larger flow capacity through parallel connections will meet the hot-water needs of most high-volume residential applications and many commercial projects, too. In short, the T-K3 fills the gap between the single residential heater and multiple commercial T-M1 units. Performance depends on the temperature of the ground water of course: At a delta T of 60 degrees F in warmer areas - for example, where the winter ground water is 60 degrees F and with the output set at 122 degrees F - the T-K3 will provide a 5.4 GPM, or 324 GPH. In colder areas where the input temperature may be 40 degrees F or less, expect a flow rate about 4.1 GPM, or 246 GPH. Mick Gage Plumbing and Heating and our employees are committed to protecting the health and environment in the communities we live in. We offer homeowners and business a quality line of Tankless water heaters to save money and help protect the environment. Our tankless water heaters are energy efficient, and help reduce airborne pollutants.